This is a loving rant, designed to help you rather than just a way to let off steam, although it’s good for that as well! You see, I have a problem with design trends. They’re the biggest thing web designers waste time on. I tweeted as much a little while ago but now I want to go into more depth of the reasons why. Unfortunately it seems like the web design industry will always be obsessed with trends. Probably the biggest thing designers waste time on. Designers love talking about trends but it’s almost completely pointless. When was the last time thinking about trends has helped you produce your best work? Many sites look very similar these days, lacking their own identity, which is a real shame and it means we aren’t producing our best work for those who need it if we’re just copying all the trends out there. Can you imagine if the Coca-Cola logo looked generic, or the Nike swoosh wasn’t unique? In a previous article, I highlighted a company who still use a skeuomorphic design, and it looks great. More importantly, they aren’t failing because they haven’t followed the latest trends. If anything it works very well for them and makes them stand out more. The important thing is they make a great product and have marketed it in an easy to understand way and the design assists in doing just that. One thing will never change in this industry is that web design will always change. We know web design changes because it always has done and it won’t stop going forward. It’s one of the major reasons we love design. With this ever-changing landscape, it’s easy to be enchanted by the latest trends but we’ve gone too far. Trends are a reflection of our ever-changing landscape but it’s hard to extract any real value out of them. Even when trends change, helping our clients and bosses deliver value to their customers remains constant. It doesn’t matter if in 50 years we’re designing for holographic space interfaces, we still have to help deliver value to their customers, build trust and create emotional connections. That is the core of what we do. Let’s look at some trend predictions for this year found in recent articles and I’ll show you why you shouldn’t be paying any attention to them at all. Remember, these are real predictions. I’m guessing they’ve been published with the intention of helping designers but with only a little thought, you can see they’re a complete waste of time. I can’t believe what I saw. Who cares?! Seriously. This is not important! Sure, gradients are interesting and something you can use but it doesn’t matter if they are a trend or not. There is nothing useful for you here. How is a gradient going to help a business get more customers or communicate with their customers more effectively or anything useful beyond just aesthetics? More gibberish I found in my research: “Responsive design calls for a ‘lean back’ content that will improve more substantive content.” Of course! Wait, what? What a gem, as is this: “A prominent tag line and a ghost button along with an elegant image is the winning recipe for a unique website.” This person must have been looking at a different internet. Both quotes were taken from the same article which, confusingly, recieved over 14,000 views. Lately, big background images have been in fashion. I’m guilty of doing the same on the Inspect Element homepage but at least I’ve injected some character with colour and I didn’t do it to follow trends. It works well for what I want it to do which is for designers to sign up to my newsletter so I can help them by sending my articles straight to them every week. A background image gives the contrast I need without resorting to a plain background which wouldn’t be as interesting. Now we’re being recommended that an absence of these background images is a trend. Why? If a big background image works for want you want to achieve, USE ONE! If it doesn’t, then don’t. Don’t just copy others because they’re doing it or because someone has identified it as a trend. Do it for your own reasons and ones that make sense to what you’re creating. Is this really the kind of advice that will make your work better? There’s nothing wrong with a fixed width centered layout but this isn’t a trend. Are you going to condense a complex web app into a single column? Probably not. There are times when it will be appropriate and times when it won’t be. You know when that will be regardless of others telling you. We know stock imagery mostly looks bad and generic. Why should this be just a trend and not the way we try to always handle photography if possible? You should always encourage your clients to source original photos and imagery. Typography has been improving on the web for years and as more and more designers improve, typography is of course also going to get better. I’d be a bit worried if it didn’t but I don’t understand why “better typography” should suddenly be a trend this year. Good designers know they need to always improve typography just like any other aspect of their work. Ghost buttons are basically buttons that allow content to show through underneath, with only the text and a border colour visible. I’ve seen this in a few articles list posts and it’s nothing more than a visual design choice. They can look good but probably aren’t the best choice for all situations, especially as content can obscure the button text. I’ve seen it happen and it isn’t pretty. It’s not enough to say they’re a trend and be done with it. Anyone with a blog can do that. It’s much more useful to teach how to use them. For example, they can be used effectively as secondary buttons to provide visual hierarchy when placed alongside a solid primary call-to-action, even without the need for a separate colour. Much more useful than creating a list of pages using them. 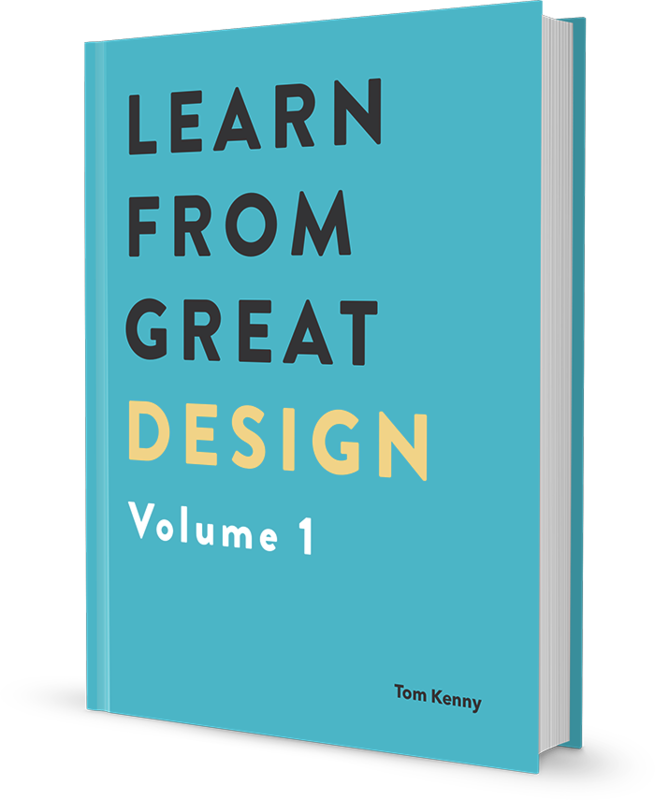 Other gems include “vibrant design”, “semi-flat design”, “the rise of material design” and “no more boxes”. None of those will help you make better websites and don’t get me started on designers’ obsession with material design. I hope it improves and evolves over time, like design should, because at the moment it seems a little uninspiring. Credit to Google for focusing more on design though. You’re in the position of explaining your design to your client or boss and they ask you why you’ve chosen a particular style or made a certain decision. Is your answer going to be “because everyone else is doing it”? I hope not. You should be able to explain every design decision you make with substantial reasons behind them. It’s been painful researching this article because the vast majority of “advice” out there on trends is useless crap and as you know, here on Inspect Element I want to truly help you get more from design, not just create a top 10 list, calling them “crucial”, “essential” or “important” just to get more clicks. I get why people want to know about trends as everyone would love to be able to look into the future somehow, so we can have a better design life and create better work. It’s also fun to predict things but don’t get bogged down with those “17 Super Ultra Mega Ultimate Crucial 2015 Web Design Trends” list posts and instead focus on the needs of your projects first and foremost. However, there is value in keeping up with the latest trends in the sense you don’t want to look out of touch with the world around you. Familiarity has its advantages when it comes to usability but style needs to be more unique. Back in 2010, I called for simplicity to be the trend of the year. The recent “trend” of flat design has helped with that somewhat, as visual design has been stripped down to only the elements that are necessary, although that can be to the detriment of character and soul of design. I meant simplicity in terms of usability when I wrote that article 5 years ago. That’s a useful trend I’m fully behind. Trends are just a distraction from the real value of web design. They aren’t ever something that can deliver real value on their own, so let’s focus more on the value of design and less on trends.